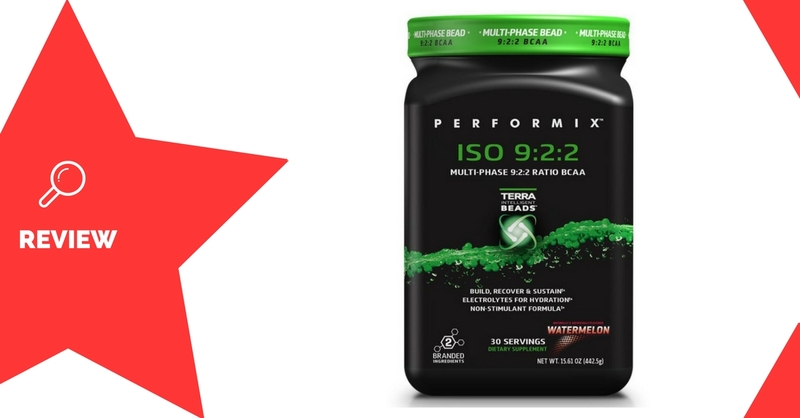 ISO 9:2:2 is an amino-acid supplement made by Performix. It’s designed to improve workout duration, performance, and recovery. Performix is a health and fitness supplement company, based in the United States. Leucine, isoleucine, and valine are what we call “branched chain amino acids”, or BCAAs. These are amino acids which prevent muscle breakdown during exercise, as well as improve growth and recovery (1). Citrulline is an amino acid which is known to increase nitric oxide levels. Nitric oxide is well-known as a vasodilator – it can expand the blood vessels. This allows better blood flow, endurance, and pumps while exercising. Citrulline malate has been shown to also reduce muscle soreness, and aid with muscle recovery and growth (2). Glutamine is also a type of amino acid which may be useful for muscle growth and repair. It’s been shown to be useful when used on its own, but doesn’t add any benefits when used with BCAAs (3). Taurine is another amino acid, commonly added to energy drinks. It’s useful for improving water and mineral uptake into the muscles, which can reduce fatigue during exercise (4). Coconut water is a natural electrolyte source. Research shows that it can significantly improve rehydration after exercise (4, 5). Sugar beets contain a compound called betaine. It’s been shown to boost power output, and may also improve body composition (6). The effective dose is 2500mg. Athletes wanting to improve their performance and recovery, as well as retain muscle mass, may enjoy using ISO 9-2-2. Mix 1 scoop (14.1g) with 250mL water daily, and consume either before, during, or after your workout. There are no significant side effects known for the ingredients used in ISO 9:2:2. Range of flavours to choose from. 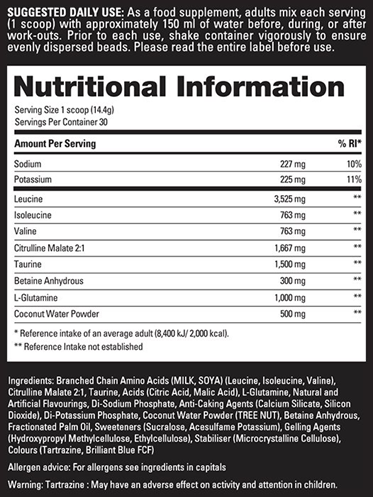 ISO 9:2:2 is an amino acid product with a bunch of added benefits. In addition to the 5g of BCAAs, the formula also includes a range of ingredients to help with performance and recovery. The BCAA ratio isn’t optimal, but it contains plenty of leucine to improve muscle retention and growth. You can expect good muscle retention, improved recovery time, and longer workouts.